Creative baby shower gifts and inspired presents for toddlers come from Baby Wonder Years. Select quality DVD's and books created by caring grandparents. Looking for a special present for a favorite toddler? Choose a unique, captivating video or book designed to intrigue young children. Child Focused (Caregivers love watching the DVD's, too)! My favorite DVD was Cellos, Bassoons and Musical Toons, no one has ever really addressed music in this way for children, it is beautiful. KIDS FIRST!® Film and Video Festival, has become the largest children’s film festival in the world. Book Review: ”Every child, every parent, indeed anyone who loves nature, art and the rhythm of language will appreciate life’s experiences and lessons in this heart-felt book”. 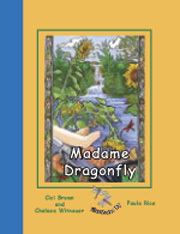 Our new book release, Madame Dragonfly is also offered with a companion DVD, the award winning Baby’s Stroll Through Nature. Your thoughtfulness and care will be evident when you choose one of Baby Wonder Year's award-winning and critically-praised videos and books. Whether you're bringing the most unique present to a baby shower, delighting a toddler with a birthday gift, or picking out a quality surprise for your own child, a DVD or book from Baby Wonder Years will stand out as a fun, interesting, and quality present. We carefully create our own materials. We are a grand-mom and grand-pop business (but our daughter Chelsea and her little girls are involved, too!) We're delighted to share our work with your family and loved ones. Read about our books and DVD's and visit our Products page for links of sample videos to download. When you're ready, you can order online or contact us for more information. Baby Wonder Years has a new fan page on Facebook. Check us out, see our events, read the latest news, and give us your comments! 3 Little Wonders is now available! This collection of age-appropriate stories will delight and captivate children from 6 months to 7 years. We pack three of our most popular videos on a single DVD. The young Piccadilly Street Players create an atmosphere of fun, excitment, interaction and wonder. DVD Run Time 9 1/2 Minutes - Wide Screen. Wheel Time Express. 2 to 5 years. Set to lively music that lets motion spin your child’s imagination. This colorful journey reveals the close-up world of wheels in soothing yet energizing motion. The wheels of old time locomotives to modern freight trains. School bus wheels, water wheels, spinning wheels, and a potters wheel! And much more. 30 minutes. Madame Dragonfly. 1 to 5 years. This book weaves a story thread that began in our award- winning video, Baby’s Stroll Through Nature. The not-so-shy and friendly red dragonfly jumps off the screen and onto the pages, colorfully illustrated by Paula Rice. Cici Brown and Chelsea Witnauer have created an enchanted forest where friendly creatures help a small child have a memorable adventure. A portion of the book proceeds will go to Makena Children's Foundation, Inc.